108 I WRAPS I 2015 C olor-change film has been embraced by the restyling market with open arms. Why? Because when it's seen on a Generation-X car it spikes on the "Richter Scale of Cool," and rates "Sick" among the Generation-Y set. 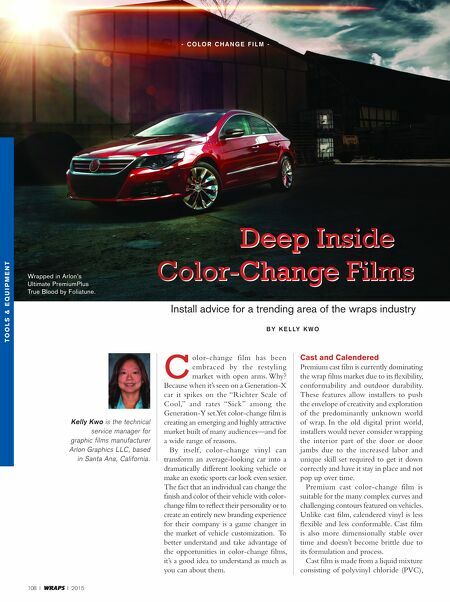 Yet color-change film is creating an emerging and highly attractive market built of many audiences—and for a wide range of reasons. 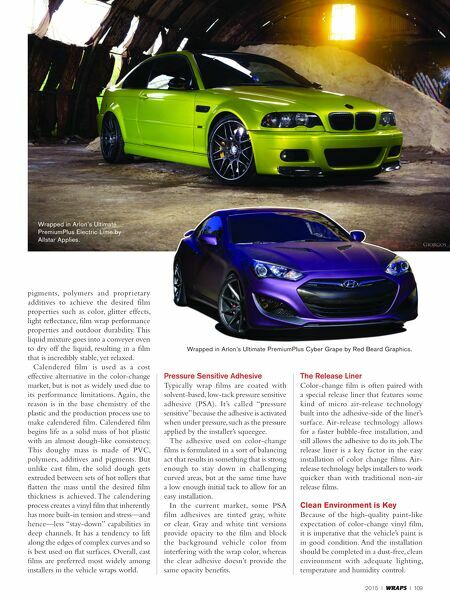 By itself, color-change vinyl can transform an average-looking car into a dramatically different looking vehicle or make an exotic sports car look even sexier. The fact that an individual can change the finish and color of their vehicle with color- change film to reflect their personality or to create an entirely new branding experience for their company is a game changer in the market of vehicle customization. To better understand and take advantage of the opportunities in color-change films, it's a good idea to understand as much as you can about them. Cast and Calendered Premium cast film is currently dominating the wrap films market due to its flexibility, conformability and outdoor durability. These features allow installers to push the envelope of creativity and exploration of the predominantly unknown world of wrap. In the old digital print world, installers would never consider wrapping the interior part of the door or door jambs due to the increased labor and unique skill set required to get it down correctly and have it stay in place and not pop up over time. Premium cast color-change film is suitable for the many complex curves and challenging contours featured on vehicles. Unlike cast film, calendered vinyl is less flexible and less conformable. Cast film is also more dimensionally stable over time and doesn't become brittle due to its formulation and process. Cast film is made from a liquid mixture consisting of polyvinyl chloride (PVC), Kelly Kwo is the technical service manager for graphic films manufacturer Arlon Graphics LLC, based in Santa Ana, California. T o o l s & e q u i p m e n T - C o l o r C h a n g e F i l m - Install advice for a trending area of the wraps industry B y K e l ly K w o Deep Inside Color-Change Films Wrapped in Arlon's Ultimate PremiumPlus True Blood by Foliatune.